AQHA Racing Champion jockey Ricky Ramiez talks with StallioneSearch.com's Greg Thompson about tough decisions to make between the multiple qualifiers to million dollar races. GRAND PRAIRIE, TEXAS—NOVEMBER 9, 2018—StallioneSearch.com begins its webcast coverage of the 2018 Texas Classic Futurity(G1) weekend of coverage on StallioneSearch.com and on Facebook. On this episode, StallioneSearch.com champion jockey Ricky Ramirez discusses the tough decision he was forced to make between the multiple qualifiers he was aboard for the trials of the Texas Classic Futurity(G1). Ramirez also talks about the similarities between the choice he had to make this past week at entry time for the Grade 1 event, and the three Grade 1 futurities in Ruidoso during the summer of 2018. CLICK HERE to watch Episode 1: 2018 Texas Classic Futurity(G1) Preview. 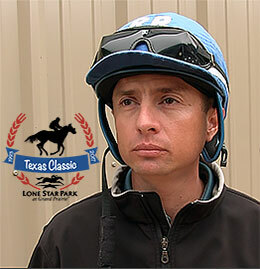 Coverage of the 2018 Texas Classic Futurity(G1) weekend at Lone Star Park is sponsored in its entirety on Stallionesearch.com by the sire Tempting Dash, standing at Granada Farms in Wheelock, Texas. The son of the legendary First Down Dash, out of the Chicks Beduino mare A Tempting Chick, is a multipole Grade 1 sire with progeny earnings of over $7.3 Million.